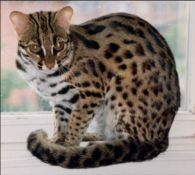 The Bengal breed originated by breeding an Asian Leopard Cat (felis bengalensis) to an Egyptian Mau, Abyssinian, or other domestic shorthaired breed. There were a number of goals for this type of breeding. One was to create a smaller version of the beautiful wild cats of the jungle, while maintaining a dependable temperament of a family pet. It was hoped that people's desire to own a wild animal would be satisfied by owning one of these exotic-looking cats. 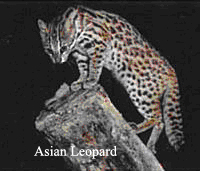 In 1963, when Jean Mill bred the Asian Leopard with the domestic cat, wild cats were being exploited for the fur market. So another goal of this breeding was to deter people from purchasing the fur of wild cats by reminding them of a family pet. 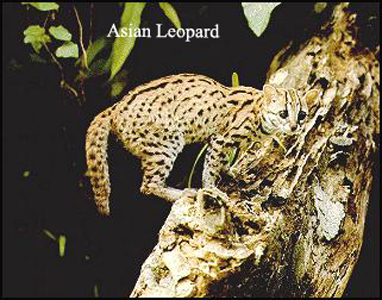 It was hoped that the decrease in demand would result in less poaching of wild cats. It appears that the trading of exotic cat fur has been restricted significantly since. 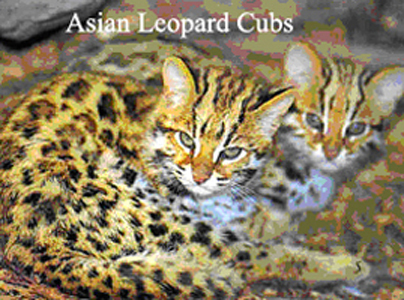 An additional goal for breeding Asian Leopards with domestic cats occured in the 1970's, when Jean Mill acquired 8 female Asian Leopard Cats (ALC) from the University of California. These cats were used to study the ALC's natural immunity to Feline Leukemia. It was hoped that by breeding the ALC with a domestic cat, the offspring would share the same immunity. Unfortunately, it was later discovered that Bengal cats do not possess the same natural immunity to leukemia as do their Asian Leopard ancestors. 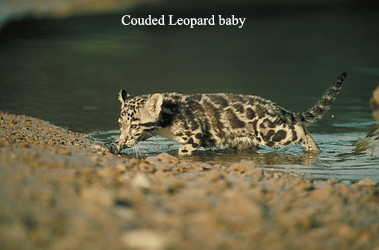 The breeding of the ALC and the domestic cat results in an F-1 kitten, the "one" signifying that the kitten is one generation removed from the Asian Leopard Cat (ALC). When the F-1 female Bengal (F-1 males are sterile) is bred to a domestic cat, the resulting kitten is an F-2. The breeding of the F-2 results in F-3, and so forth. 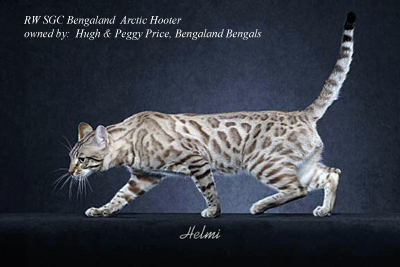 Only Bengal to Bengal breedings that are at least four generations removed from the ALC are considered "domesticated" and accepted in the show halls. These Bengals are referred to as Stud Book Tradition (SBT). There are a number of different colors and markings on a Bengal. 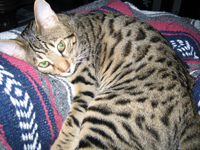 The traditional brown spotted Bengal is the one that most closely resembles the ALC. These Bengals have brown or black spots set on a golden, tan, or an orange variant shade body. The spots should flow horizontally, and the greater the contrast between the spots and the ground color, the better. The marbled pattern is a combination of swirls and rosettes flowing in a horizontal fashion. The pattern should be random, flow horizontally, and give the impression of marble. 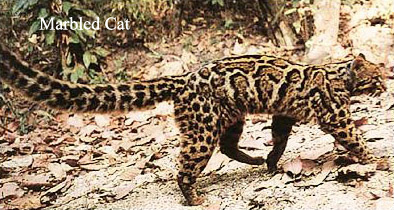 Though this pattern was derived from the Classic tabby gene, they share a strong resemblance to the Clouded Leopard and Marbled Cat. Again, these wild cats only share a resemblance in pattern with the Marbled Bengal, and have in no way been used to breed Bengals. 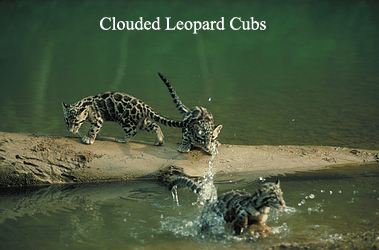 Below are some pictures of marble patterns here shown with some pictures of Clouded Leopards. Though the Bengal cat is no related to the Clouded Leopards, it shows one type of pattern to strive for in the marble Bengal cat. Snow Bengals are just like traditional spotted and marble Bengals, except for that their spots or marble are on a white background. There are many variations of snows, including the seal mink, seal lynx, and seal sepia. 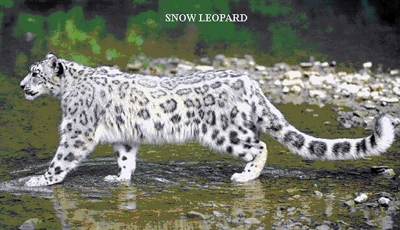 Snow Bengals are meant to resemble the snow leopard.